“Applying the soothing salve of sambhanda-jnana, a proper acquaintance with the environment, my spiritual master has opened my inner eye and thereby rescued me from the darkness of ignorance, fulfilling my life’s aspirations. I offer my respects unto Sri Gurudeva". ”We are blessed to be here in the association of our Sri Acharyyadev His Divine Grace Srila Govinda Maharaj, along with his beloved devotees in Soquel, California. His Grace is gradually recovering from the strain of traveling and is reminding us that he has come here, in part, to improve his health in the peaceful atmosphere of this rural ashram. Today Srila Gurudev showed more energy and came down to the temple room, offering his dandavat pranams to Sri Sri Guru Gauranga Gandharvika Giridhari and graced the assembly of devotees with sweet harikatha. After ten minutes or so, Srila Gurudev said that he was not able to talk very much. He added that he wanted to speak longer, but he had spent most of his life talking. And now he could not stop. What to do? Earlier, in his room, His Divine Grace enthusiastically told about the pastimes of Sri Adwaita Acharrya and his consort, Sita Thakurani, whose appearance day was recently observed. He shared one story about Adwaita Acharyya Prabhu, who was lamenting that Mahaprabhu was always giving him too much honor. The Vaisnavas and Mahaprabhu offered all respect to Sri Adwaita Prabhu because of his advanced age but did not allow him to reciprocate in the same way. This distressed Sri Adwaita Prabhu so much that he devised a plan to trick Mahaprabhu. Sri Adwaita began to preach the Mayavadi philosophy in the village. A report came to Mahaprabhu that Adwaita Acaryya Prabhu was now engaged in preaching about the impersonal form of the Lord. Mahaprabhu showed His divine anger and began beating Sri Adwaita with a stick. He beat him over and over while chastising him until Sita Thakurani intervened and begged Mahaprabhu to stop. She reminded the Lord that Her husband was an old man who would surely die if the beating continued. But all this time Sri Adwaita Prabhu, in his humility, was feeling so much happiness. The Supreme Lord was no longer treating him with great respect, but blessing him again and again with His blows. After recalling this pastime with a delightful grin, Srila Gurudev made comments about the clean air at the Soquel Seva Ashram, which is situated on several acres of a beautifully wooded gulch, or ravine, near the northern California coast. He said he believes the climate will aid his healing He also made observations about the changes he sees since his last visit four years ago. He pointed out that the bright yellow sunflowers are so much bigger. He showed affection for the ashram dogs and told stories about the dogs he had in his earlier years. After taking a little walk around the beautiful grounds of the ashram, which include fruit orchards and flower gardens, Srila Gurudev said he thought this Soquel ashram was like Govardhan. He repeated that Soquel reminded him of Govardhan and San Jose of Vrindavan. So often he sees places come in twos like this. In Calcutta, there is Dum Dum Park and Kaikhali; then there is Nabadwip and Hapaniya. Near Vrindaban, in the district of Mathura, there is Govardhan. Looking out to the rear of the temple, one can see how the land rises gently to form a broad hill that is reminiscent of Sri Govardhan. Hearing Srila Govinda Maharaj share this holy vision makes us appreciate the land and the many devotees who are serving in this ashram. 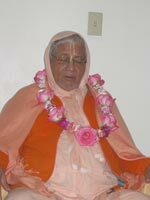 Now there are many devotees visiting and seeking the mercy of Srila Gurudev and the Vaisnavas. Today it rained very hard and devotees from Tijuana and other areas of Mexico, Venezuela, England, Canada, Oregon, Utah, and many different cities in California made their way through the downpour to the shelter of His Divine Grace’s feet. He seemed happy to see his growing family in front of him. At one point he asked about the possibility of expanding the size of the visiting room. With a similar sentiment, I offer my obeisances to His Divine Grace Srila Govinda Maharaj, our divine Guru-varga and all the venerable Vaisnavas.